A long river of time has passed since there were, dwelling in this wild and beautiful country, the Amber and Copper people, ancient clans of the high moors. They built with stone and worked with bone. They sung to the wonder of all life and their footsteps fit close into the earth. They were wed to the very soul of the land. This album represents their story. 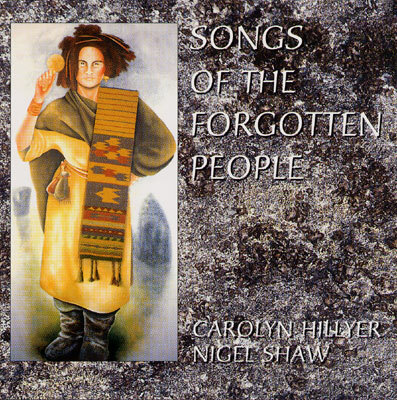 Inspired by an ever-deepening respect for Dartmoor and working with the ancient memory held within its granite heart, Carolyn Hillyer and Nigel Shaw have pushed forward their own musical boundaries to combine original and haunting song composition with an unusual and varied texture of instrumental pieces. Instruments used include: handmade wooden flutes (oak, yew, rosewood, holly and pine), triple clay flute, whistles, reed pipes, herd whistle, frame and pot drums, djembe, rattles and shakers, voices and keyboards. In four principle movements this album encompasses complex rhythmic chants, uplifting gentle melodies and powerful song.